Fun Spot America is a complete family amusement park with roller coasters, thrill rides, multi-level Go-Karts, and much more. Enjoy all day riding privileges on the amazing choice of family and thrill roller coasters at your choice of either Fun Spot Orlando or Fun Spot Kissimmee. 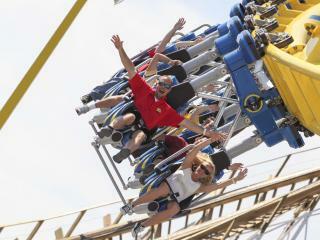 Enjoy all day riding privileges on Roller Coasters, Thrill Rides, and Kid Spot Rides! Located just off International Drive in the heart of Orlando, Fun Spot Orlando is home to White Lightening, Orlando’s only wooden roller coaster. Enjoy this throwback to the days of Coney Island which treats riders to the old-school thrills of gravity-driven speed and unexpected airtime reaching speeds of up to 48 miles per hour. In the Orlando park you will also find the Freedom Flyer, America's longest Suspended Steel Rollercoaster. Soar on the wings of this family friendly inverted coaster with speeds of up to 34 mph. Whip through tight turns that spin you around and test your nerves with heavy G forces all while your feet dangle just above the crowds. Other attractions Space Invader and Rip Curl where one to three people spin round and round as the music blasts and then begins again as it spins backwards too! 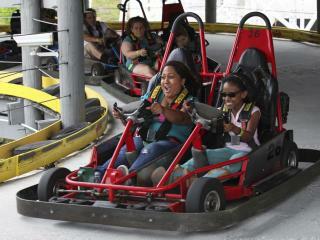 Here you can also race on the unique multi-level go-kart tracks. With four tracks to choose from, there is a track for everyone! The Kid spot is perfect for the little ones, with a choice of Kiddie Swings, Coasters, Tea Cups, fun slides and more and the Orlando park also includes Gator Spot which brings the excitement of live gators to the park. Smiles, laughter and great memories are what you have in store when you ride any of the awesome family rides! Fun Spot Kissimmee. is situated just 5 Kilometers from the Maingate to Disney and offers a great range of family-friendly and thrill rides including the amazing multi-level go kart tracks. With four tracks to choose from, there is something for everyone! The Vortex track is 4 stories high and features the world’s steepest banking curve at 32 degrees! The Daytona Speedway can’t even match thatand even younger children can enjoy the action with an adult driver in one of the double-seat go-karts. If you are looking for thrills the take a spin on the Rockstar Coaster that produces heavy G forces as you go around sharp and tight corners. With up to 3 people to a seat, your whole cart will be screaming! Other highlights include Hot Seat which swings you back and forth through 180 degrees and Sceaming Eagles which will certainly make you scream as you go up. You’re not really sure when you’re coming down! The Kid spot is perfect for the little ones, with a choice of kiddie bumper cars, fun slides, the Kiddie Coaster and the the castle-themed fun house Castlemania with obstacles to climb, tunnels, a ball pit and slide. Little ones will love flying in the Baron Planes, a throwback to iconic World War I fighter planes. Both parks have their own SkyCoaster, which combines the thrill of skydiving and hang gliding in one exhilarating ride. Ride in groups of up to 3 people as you take flight on the World’s Second Tallest SkyCoaster at 250 ft.There is an additional cost of $20 payable locally to ride the SkyCoaster. SkyCoaster flights, food, arcade games, and vendor attractions are not included in the Single Day One Park Pass.